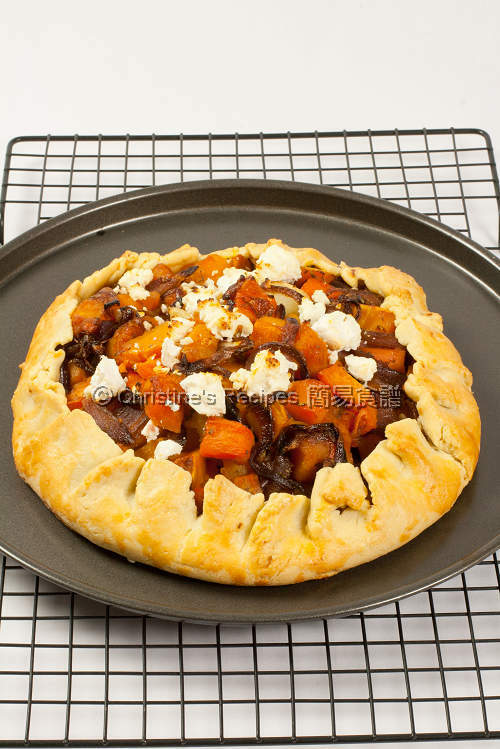 I didn’t know that my daughter is a big fan of feta cheese until I baked this Pumpkin & Sweet Potato Feta Pie. When I was about to sprinkle the feta onto the vegetables, she grabbed a big piece of it. She told me that’s her favourite cheese after enjoying the big bite. Not surprisingly, I found my hubby is not quite into the cheese. My daughter’s palate is quite different from my hubby’s. Being a home cook, I always have to juggle, sometimes swing back and forth in cooking some western and oriental dishes to suit their different palates. Nearly half of the 8 inch pie was eaten by my daughter. As for myself, I love the shortcrust, as it’s easy to make and yummy. The caramelized onion was cooked with a well-balanced sweet and tangy taste, going so well with the pumpkin and sweet potato. Preheat oven to 200C (395F). Place pumpkin, sweet potato and garlic cloves in a baking pan and mix well with olive oil. Bake for 20 to 25 minutes, or until the pumpkin and sweet potato are tender. Remove from the oven. Let cool. Meanwhile, heat oil in a frying pan, add the onion and cook for 10 to 12 minutes. Pour in the vinegar and sugar and cook for another 12 minutes, or until the onion is caramelized. Remove from the heat and add to the pumpkin. Let cool completely. Squeeze out the garlic flesh. Mix in feta cheese and rosemary to the vegetables. Season with salt and pepper. Roll out the pastry to a 24cm (9½inch) circle. Place onto a baking tray lined with baking paper. 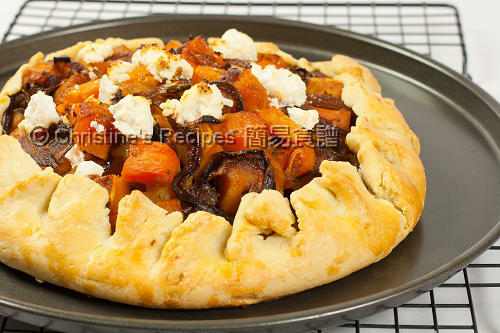 Spoon the vegetables in the middle of the pastry, leaving 4cm（1½inch）border. Fold over the edges, pleating as you fold. Brush whisked egg on the edge. Bake for 25 to 30 minutes, or until golden. Served hot. 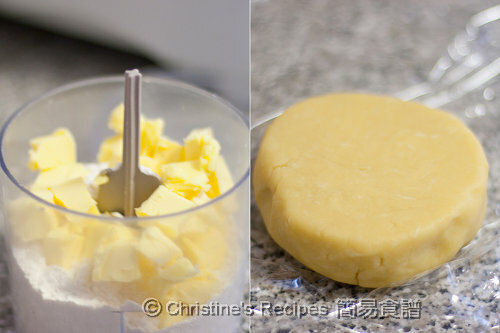 Put flour and butter into a food processor and blend for about 1 minute. Add 2 tablespoons chilled water and process until the mixture comes together. Knead into a circle or disc with hands. Wrap the dough in plastic wrap and chill for 30 minutes. It’s ready to use. If the dough chills longer and becomes hard, not easy to roll out, you can leave it at room temperature for a while, until it becomes soft again. This looks so scrumptious. I love the combination of sweet from the squash and potatoes, salty from the cheese, tart from the balsamic and then the creamy caramelized onions.. OK, I have got to make this! looks beautiful, must be tasted great too. I'm particular intrigued by your adding of the caramelized onions. I am utterly enticed with this gorgeous looking pie! My kind of pie! Love the sweet flavours and the saltiness from the feta. yum! This looks beautiful and absolutely delicious... perfect for the fall. Thanks for sharing! Oh I am so going to try your recipe, love the look, can already smell it baking away. Have never thought of putting squash on a pizza, but why wouldn't you? Wonderful colors and use of what's available in the produce section-- I would love to eat that!